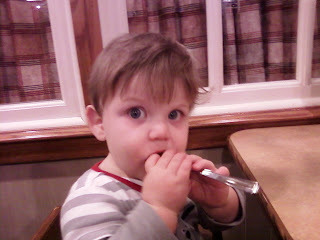 While Mom, Alyce, and I were eating dinner at Bob Evans Luke was busy eating a spoon. Well he ate more than a spoon. He ate some mashed potatos and nibbles of biscuit. Luke also flirted with the elderly couple behind us and the waitress. Luke is always happy to meet new people and always seems to spread his happiness to others. Luke, you have a gift.